Pau Lopez // 20 // Espanyol // Goalkeeper: A product of the Espanyol youth academy, 20 year old Pau Lopez has been given the responsibility of guarding the Espanyol goal on a regular basis. The youngster has featured in every league game so far this season. Espanyol took on Real Betis away from home and came home with all three points after the score board read 1-3 at the end of the 90 minutes. Despite outscoring the home side, credit has to be given to Lopez for his performance in the game. It’s not easy for managers to have faith in young and inexperienced goalkeepers but it’s nice to see when it happens. Hector Bellerin // 20 // Arsenal // Right-Back: After a more than impressive display at the Emirates prior to the international break against Manchester United, Arsenal took on Watford away from home. The London club went back home with all three points with the game concluding with a 0-3 score line. Bellerin once again had an excellent day, a feat that is becoming more common by the week. The 20-year-old has seemed to have done enough to convince Arsene Wenger that the right-back position is his and his alone. For his age, the lad has a calm head and the right mentality that every manager would want. The La Masia youth product chipped in with an assist this weekend. 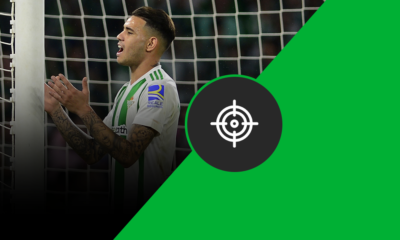 Jose Gimenez // 20 // Atletico Madrid // Centre-Back: Another Talent Radar regular from last season, Jose Gimenez making it into a Talent Radar Team of the Week article is no surprise. It’s quite hard and yet pleasantly surprising to see a 20-year-old have such talent and composure, not to mention the discipline to play at this level of football. Atletico Madrid were away to Real Sociedad on Sunday; Diego Simeone’s men winning the game 0-2 with another impressively organised defensive display where none other than Gimenez was found at the heart of things. Peet Bijen // 20 // FC Twente // Centre-Back: A product of the FC Twente youth academy, Peet Bijen is into his first season of senior club football. FC Twente took on Nijmegen as club football returned to centre stage after a disappointing international break for Holland. It was Bijen’s effort on goal that found the back of the net and proved to be the deciding goal between the two clubs. We’ll be keeping a close eye on this youngster who has impressed many with his performances so far. Baba Rahman // 21 // Chelsea // Left-Back: Highly rated Baba Rahman was the subject of transfer from Bundesliga side Augsburg to Chelsea in the recent transfer window. Jose Mourinho made sure to ease the youngster into the side and the style and pace of play. Rahman earned his first start and first Premier League minutes in the league game against Aston Villa this weekend, the match ending in a 2-0 victory for the under-fire English Champions. The 21-year-old looked solid at the back, composed and steady which is exactly what Mourinho would have wanted from his defender especially since the back four have repeatedly let him down so far this season. Leroy Sane // 19 // Schalke 04 // Winger: Hertha BSC were visitors to the Veltins Arena and saw a match that progressed evenly contested until the dying minutes of the game when Schalke grabbed the winner to steal all three points. The stoppage time goal was scored by Max Meyer, a regular in Talent Radar circles in previous seasons. 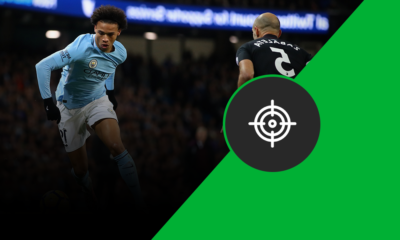 The goal was assisted by 19-year-old Leroy Sane, a product of Schalke’s famous youth academy. Sane already has three goals to his name this season and is proving to be an exciting young player to watch. Mahmoud Dahoud // 19 // Borussia Monchengladbach // Central Midfielder: After a five game losing streak at the start of the season, Gladbach seem to have finally found their feet. This weekend, they were visitors to Commerzbank Arena to face Eintracht Frankfurt and eventually ran away with all three points. The game ended in a 1:5 score line, with 19-year-old Mahmoud Dahoud providing a major contribution with a goal and two assists to his name. After seeing limited game time in the first few games of the season, Dahoud has got a lot more minutes per match under his belt which coincides with Gladbach’s turn in fortunes. Simon Gustafson // 20 // Feyenoord // Central Midfielder: One of two players to feature in this week’s Team of the Week from the Heerenveen-Feyenoord game that ended in a 2-5 win for the visiting team is Simon Gustafson. The 20-year-old, who graduated from the Feyenoord academy made a solid impact on the game in the 82 minutes that he was on the pitch, scoring one and assisting three. After being left out of the squad for the start of the season, the youngster has a goal and four assists in his last two games, hopefully enough to convince manager Giovanni van Bronckhorst to reserve a place in the starting XI. Raheem Sterling // 20 // Manchester City // Winger: Bournemouth were the victims of a 5:1 thrashing at the hands of Manchester City on Saturday with Raheem Sterling causing most of the havoc. The England international scored a first half hat-trick against Eddie Howe’s side, with the goals telling much about his improved finishing ability when compared to his Liverpool days. 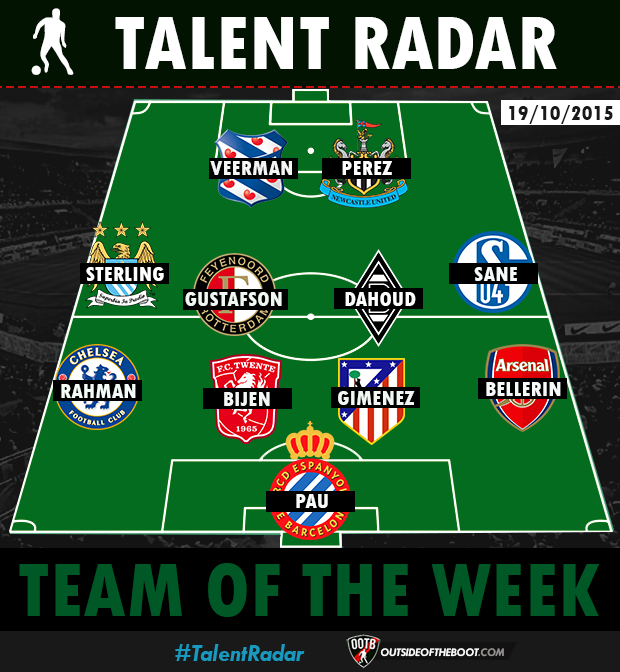 Sterling was a regular in our Talent Radar Team of the Week articles last season and it’s unbelievable that he is still just 20 years of age. Ayoze Perez // 22 // Newcastle United // Striker: Newcastle faced Norwich at home this weekend with pressure mounting further and further given their abysmal season so far. The Magpies did take home all three points from the game that ended with a 6-2 score line. Most of the headlines will focus on Georginio Wijnaldum’s performance but Perez’s contribution throughout the game cannot be left unnoticed. A goal and an assist in the ninety minutes is further proof as to why we quoted him as a bright spark in the rather dull Newcastle set up last week. Henk Veerman // 22 // Heerenveen // Striker: Heerenveen took on Feyenoord on Sunday at home and youngster Henk Veerman had a bittersweet day, having scored a brace in that game despite his team going on to lose the game by a 2-5 score line. The brace was the mark of Veerman opening his account in the Eredivisie this season. Heerenveen are looking to be in a mess at the moment having won just one game so far this season and would be quite grateful if the 22-year-old can use this recent game as a start to help turn things around.